Sammy Hagar is claiming that the Alex and Eddie Van Halen are trying to prevent him from performing songs from the band’s Van Hagar-era. Hagar continues to play material from his time in the group when he performs solo and with any of the supergroups he’s a part of – the latest being The Circle, with bassist Michael Anthony, drummer Jason Bonham and guitarist Vic Johnson. 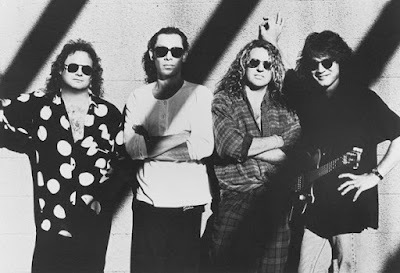 Hagar then goes on to speculate about the band’s motives while attempting to take a shot at the ability of original Van Halen vocalist David Lee Roth. The Red Rocker tells Trunk the Van Halen brothers are out to shut his efforts down. “I’m going, ‘I’m gonna break these guys’ neck’”, threatens Hagar. “It’s like they’re so jealous they can’t do them and they don’t want them to be heard because they want to pretend like it never happened because of what they’re doing now. Hagar brought up a recent example of the situation as it unfolded during a taping of his appearance on Live From Daryl’s House with Daryl Hall. Hagar joined Van Halen in 1985 and – with rare exception – performed virtually the same three Roth-era songs in concert during his time with the group – “Panama”, “Ain’t Talkin’ ‘Bout Love” and the band’s cover of The Kinks’ “You Really Got Me” – while playing the same number of tunes from his solo career in the set. Van Halen – with Roth – will kick off a North American tour in support of their latest release, “Tokyo Dome Live In Concert”, in Seattle on July 5.